What Yoga to do when I’m Injured? My name is Lena Holmes… I follow you on Facebook and Instagram and you follow me back on IG (naturallywildphotography). Anyways, I’ve been doing your yoga classes for a year and I love them.. They totally got me into yoga and it’s safe to say that I am addicted now! However, as of recently I have a huge problem, which is why I’m emailing you. 7 years ago I got into an accident and very severely broke my collarbone. The break never healed properly and is only held together by scar tissue. It has always given me pain but it was just a daily, normal dull aching. However the effects of the break are not only on my collarbone area but also my shoulder and arm. Well as of recently I believe I re-injured it and due to this fact, I have chosen not to do yoga out of fear of injuring myself even worse. So what I’m wondering is do you have a class, or you can you create a class that would be friendly to people who have had shoulder/arm (or in my case, collarbone) injuries, while still getting most of the physical body benefits from yoga? This is a great question and I am going to answer it in a video blog post because it is a question that applies to a lot of people and one that I would like for many people to benefit from hearing the answer. 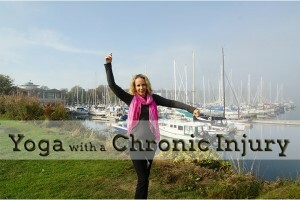 I think what stands out here is how to do yoga with a chronic injury. This is a question that is near and dear to my heart right now because I am also practicing yoga with a chronic injury right now. Ironically it is also a shoulder injury. Right now I am living with some version of supraspinatus/shoulder tendinitis and frozen shoulder. What I think applies for everybody in your situation is the need to seek professional help. 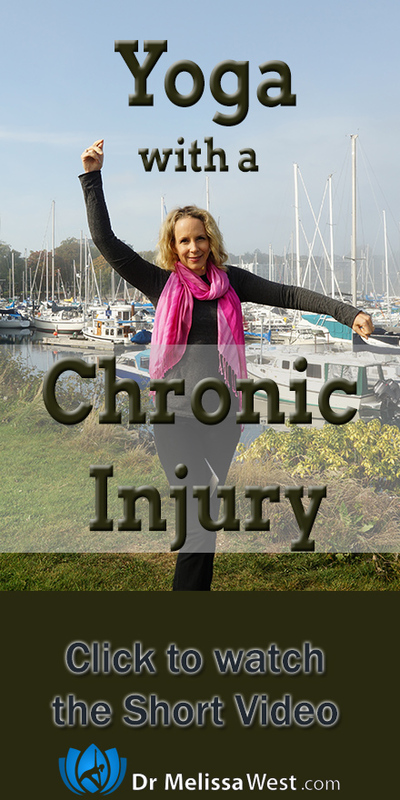 If you are dealing with a chronic condition, that is pain that doesn’t go away, it is really important to go to your medical doctor about it. This process involves patience, because it takes time to go through the course of diagnosis, x-rays or ultrasounds and referrals to specialists that might be necessary. Please have patience with this part of the process it is necessary. better than that with the knowledge of how to improve your condition! YAY! So I can refer you to a whole bunch of yoga classes for shoulders, however, the most important thing is for you to come to a yoga class armed with the knowledge of how to best care for yourself in this yoga class. Only you can do this by practicing due diligence by making sure you have gone to your doctor and been referred to the appropriate specialist who can teach you what movements you can and cannot do as a result of your injury and what movements are best for your rehabilitation. You are always your own best teacher, however sometimes we need to back up and refer to the experts and ask them to help us when it comes to things like injuries so that we can rehabilitate correctly and take care of our bodies in yoga classes.